Product prices and availability are accurate as of 2019-04-20 10:55:42 EDT and are subject to change. Any price and availability information displayed on http://www.amazon.com/ at the time of purchase will apply to the purchase of this product. 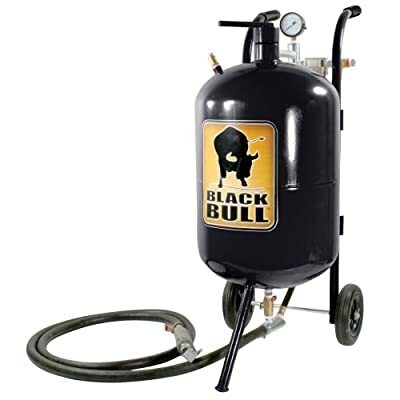 Remove oxidation, paint and rust with the Black Bull 10 Gallon Abrasive Blaster. This steel sandblaster allows for a diverse amount of surfaces to be cleaned during a single blast time. Designed for contractors and serious do-it-yourselfers, this steel sandblaster is an easy way for you to clean a variety of different surfaces including metal, wood, brick or concrete. Features a 10 gallon tank capacity with shut-off valve. Includes everything you need to get started. Just connect to a compressor, put on safety gear and fill with abrasive sand.